Organisations around the globe are adopting accredited certification to ISO 50001- energy management systems to achieve energy, economic, and sustainability benefits that boost competitiveness. ISO 50001 offers a transparent, business-friendly way to align corporate goals with national climate and energy goals. 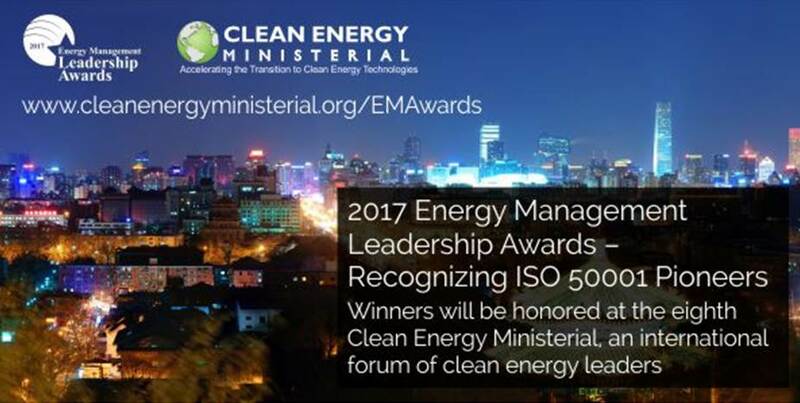 The Clean Energy Ministerial (CEM), a global forum consisting of 24 countries and the European Commission, has established an Energy Management Leadership Awards programme to recognise those who are actively transforming their organisations with accredited certification to ISO 50001. UKAS accredited Certification Bodies are encouraged to share this news with their ISO 50001-certified clients in the UK to enter. The 2017 CEM Energy Management Leadership Awards will raise global awareness of the benefits of energy management and accelerate uptake of these systems to support corporate, national, and global climate goals. Industrial, commercial, and public sector companies or facilities are eligible to enter the Energy Management Leadership Awards if they hold a current, third-party-verified ISO 50001 certificate. To enter the competition, each organisation must submit a structured case study describing their energy management experience and the resulting benefits, which will be evaluated by an independent panel of international experts. The winning organisations will be recognised next year during the eighth Clean Energy Ministerial (CEM8) meeting, which will be held in China and attended by energy ministers and corporate leaders from around the globe. Beyond the Award of Excellence, each organisation that submits a qualifying entry will receive an Energy Management Insight Award for helping to build global insight on the benefits of energy management systems. Top-ranked submissions from each country will also be communicated to the appropriate country governments, which may present national energy management awards of their own. Interested parties are encouraged to visit the CEM Energy Management Leadership Awards website to learn more about the award rules, entry format, scoring, and recognition. The submission deadline is 24 January 2017.